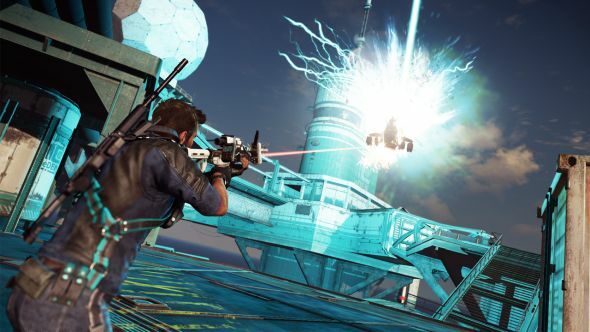 Just Cause 3 is having its swansong, at least as far as promised extra content goes, and it’s happening on August 11. Bavarium Sea Heist is the final part of the Air, Land & Sea Expansion Pass and goes live on that date for those who bought. If you didn’t, but want this bit anyway, it’ll be August 18. It’s about getting into an offshore research base, stealing their lightning gun, blowing it up (probably shoulda predicted that one) and then leaving. You also get a really quite nice boat. For more in the popular blowing-everything-up-forever genre, try our favourite sandbox games. Said boat is mostly used for blowing things up, as seen above. Perhaps more interestingly, the lightning gun isn’t your standard beam of death, but more like an orbital strike device for attacking from above. Seems to be rather effective against aircraft, particularly. Along with the obvious new areas, weapon and vehicle, there’s multiple missions set there and a new challenge type – we’re betting involving the boat, somehow. JC3, the season pass and this DLC are all available on Steam.